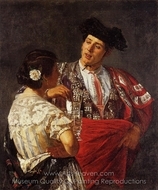 The paintings of nineteenth century American artist Mary Cassatt are still popular today for a number of reasons. For one, many of her paintings display endearing images of children and mothers in natural settings. She used soft colors to tell a story about her subjects. 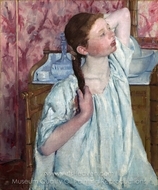 Cassatt's paintings convey a warmth that many people are drawn to. 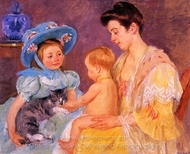 Consequently, Mary Cassatt paintings are familiar sights in many homes and offices. 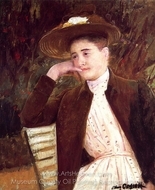 The following looks at some of the beloved artwork of Mary Cassatt. 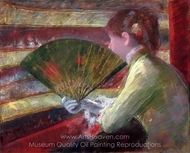 The work of painter Cassatt is classified in the period of Impressionism art. Generally, impressionists used real life subjects and experimented with light and shadow in their work. Luxurious, deep colors are also a hallmark of the era of impressionism. 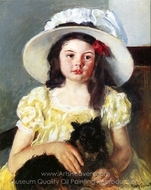 Many Cassatt paintings depict mothers and children in domestic situations. 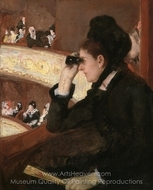 Some of the common scenarios found in the work of painter Cassatt are women reading, sewing, or visiting with friends. 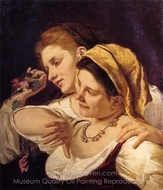 Also, when it comes to Mary Cassatt paintings, a mother cradling her small child is a familiar theme. Some famous examples include Emmie and Her Child, Mother About to Wash Her Sleepy Child, and Mother and Child. 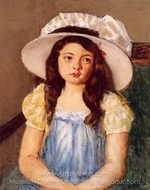 In many cases, Mary Cassatt painted family members instead of trying to find models for her work. This added another element of intimacy to her paintings. 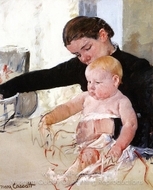 Many of the paintings celebrated the closeness between a mother and a child. For example, the mother in her work entitled, Motherhood, is lightly kissing her child while cradling him against her. The love that the mother in the painting feels for her baby is evident in the way she is holding him. 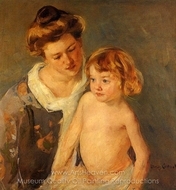 The timeless idea behind Mary Cassatt's Motherhood is the unbreakable connection between mother and child. Another example of a Cassatt painting with a familiar subject is Children on the Shore. It depicts two children sitting side by side playing in the sand on the beach. The painting is a celebration of simple childhood joys. 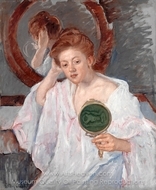 Impressionist painter Cassatt was an expert at communicating the dignity and beauty found in everyday situations. 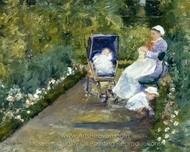 Perusing the selection of Mary Cassatt pictures at Arts Heaven is a fun idea for anyone who is decorating a nursery. 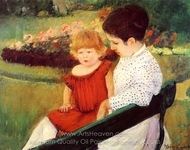 Mary Cassatt paintings featuring a mother and a child are engaging and classic additions to the acute of a nursery. Furthermore, Arts Heaven has a number of Mary Cassatt pictures that would be perfect gifts for a mother-to-be. The vibrant colors in Mary Cassatt paintings can immediately light up a room with walls painted in a neutral color. Arts Heaven proudly offers customers a selection of Mary Cassatt pictures that are sure to meet the needs of art lovers and decorators alike!